During this time, Consulting for and with clients in their own homes, workplaces and providing medical driving assessments has been the focus . 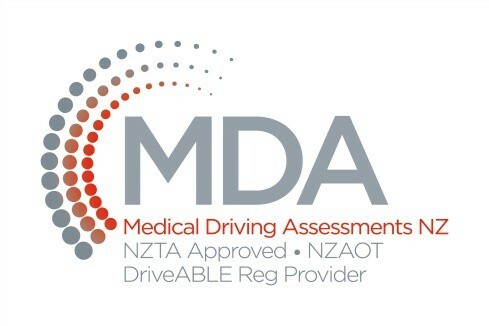 Clients are referred by – Medical Consultants and General Practitioners, NZTA Medical Review Team, NZ Police, ACC, WINZ, CADS, Rehab Plus and DHB Teams, MSOP, Private Corporations as well as by concerned families and self referrals. The consultations are client focussed and interventions are evidence-based – Contact us. The first time I met Anne (Occupational Therapist NZOTR, NZTA approved medical fitness to drive assessor & DriveABLE evaluator) I was a little nervous, but she was so friendly and warm hearted towards me. This immediately made me feel comfortable and relaxed. I thought perhaps she is a psychologist as well. Armando (NZTA approved instructor & course provider, and DriveABLE evaluator) was also so friendly and patient. English is my second language, and when I didn’t understand the information immediately, Anne and Armando explained it again and again. Also Armando taught me how to avoid car accidents, which is information you would not be able to find in the NZ Road Code book. When I finished the first lesson, I knew straightaway it was worth it. I finished the last lesson yesterday and I’ve got the ‘Certificate of Completion’ from MDA. I feel I am much more confident when I am driving now, and I am sure it has the reduced the potential for me to have another car accident. I have told Anne I will come back to have more lessons from MDA when I reach 75 years old. 11.11.15 Haigh Lyon Lawyers engaged Anne Molloy Occupational Therapist to undertake an assessment of the work sites for their staff. We found Anne to be personable and professional and the staff enjoyed their interactions with her. Her report was thorough and her suggestions pragmatic. We would have no hesitation to recommending her services to others. “For many years, I believed that my mother was a good driver. It wasn’t until she met Anne did I realise her cognitive skills were impaired to the point where it affected her driving capabilities. As a student currently undertaking the neurosurgery pathway, I can definitely say that Anne’s expertise with the medical cognitive sciences is just spot on! Coupled with her professionalism and her altruistic persona, anyone undertaking her services is assured to be in safe hands. Armando, my mother’s DriveABLE evaluator and driving instructor, was also instrumental to my mother’s driving tuition. His admirable thoroughness, alongside his medical and driving background, ensured that my mother’s competency was well-developed and, henceforth, made me appreciate the fact that she was definitely receiving a sound tuition. “I thought I was a good, careful driver but I was involved in an accident which made me rethink my ideas. I had an assessment with Driveable and to my shock, was found wanting. I have since had lessons and attained a Certificate in Advanced Driving Skills and I am now a lot more confident in my driving safety and ability. Thank you Anne, I appreciate your friendly approach and professionalism. “Thank you so much for the caring courtesy that you showed Aunty today. The testing went off much better than had I hoped and I think you must have an amazing skill set for encouraging the reluctant elderly. 12.11.12 Medical Driving Assessments - "Cognitive Impairment and Driving"
“Thanks for your really good talk at the GPCME conference. This is something we GPs really struggle with. A patient said to me recently, ” if I can’t drive I might as well be dead”.